Last Dance: Who's Gonna Be Crowned King of the Prom? As singer Don MacLean so aptly put it, 3 Feb 1959 was the Day the Music Died. Buddy Holly & the Crickets -- the name that inspired John Lennon to name his group the Beatles -- had put Lubbock, Texas on the cultural map, and then it was gone again. Mike Leach did his bit there for a while, and Patrick Mahomes is definitely a favorite son. Now, the home of Texas Tech is thinking they're on the cusp of another long run in the spotlight. Then there's the allegedly staid bastion of Eastern Seaboard establishment in Charlottesville, the University of Virginia. Bobby and Ted Kennedy are alumni. So are Tina Fey and Edgar Allan Poe. It was founded in 1819 by none other than Thomas Jefferson. OG was long gone by 1893, so he never got to call UVa's Cavalier athletic teams the Hoos. Becoming the first March Madness top seed to lose to a 16-seed. Virginia's been a poll darling all season long, but during the tournament, dudes have dodged more bullets than Neo. Now comes the Hoos' biggest challenge of the spring, as well it should, in their attempt to finally claim a national championship that'll atone for all their previous frustrations. All signs are pointing to this clash being a grinder royale. Bovada has set the line at Virginia -1, with the total a bare-knuckle 120 and the moneyline coming in at Texas Tech even and Virginia -120. Since that 79-74 loss to West Virginia in the Big XII tournament, the Red Raiders took it as a wake-up call and have turned into a juggernaut. Dudes have dominated their foes in the Dance, going 5-0 both SU and ATS. No win was as impressive as the 61-51 victory over Michigan State in the Final Four semi-finals. Tech held Sparty to 31.9% shooting from the field and 29.2% shooting from three. They're playing better than Virginia right now, and it could show again tonight. The Cavaliers have been one of the top teams in college basketball all season long. They battled Duke and North Carolina throughout the ACC regular season while leading the nation in points allowed. Opponents average 55.5 points per game against them. Dudes hold their opponents to 38.4% from the field and 28.7% from three. In the 63-62 win over Auburn in the semi-finals, they held the Tigers to 38.2% from the field and 29% from three. If they play that type of defense tonight, they could be the team hoisting the hardware. Frankly, Virginia got lucky at the end against Auburn, as they did in overtime in the Elite Eight after a double-take make against Purdue at the buzzer to tie it after regulation. 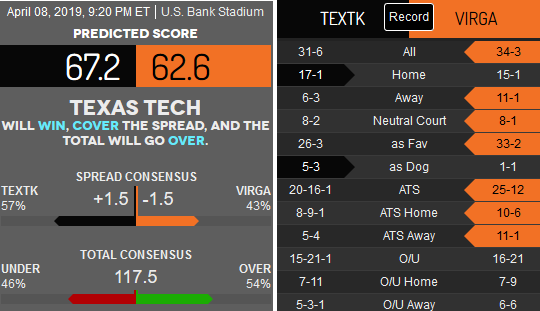 But, although that’s true, it doesn’t mean the Hoos can’t beat Texas Tech. Dudes have been the much better team throughout the season; they just find a way. Texas Tech, though, hasn’t just beaten their Big Dance foes. They’ve dominated. Not only that, there’s a key stat that should hand the Red Raiders the win tonight. Virginia shoots 39.3% from the arc. The Cavaliers have used three-point shooting to keep them in games and eke out victories throughout the Madness. Unfortunately for Virginia, the Red Raiders’ three-point defense has been on a different level in the tournament. Unless Virginia suddenly breaks the Red Raiders stranglehold on three-point shooting, Texas Tech should win, and it might not be all that close.